Superstar Rajnikanth gifted his fans a teaser of his forthcoming movie Kaala on Holi. 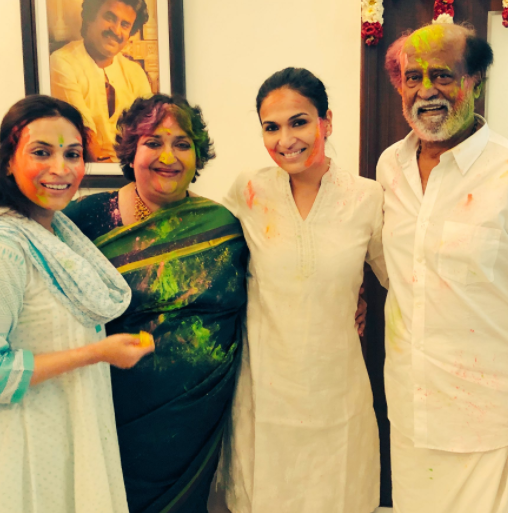 Today, Thalaivar was seen playing Holi with his wife Latha Rajinikanth and daughters Aishwarya and Saundarya at his residence in Chennai. Superstar Rajnikanth gifted his fans the teaser of his forthcoming movie Kaala on Holi. Today, Thalaivar was seen playing Holi with his wife Latha Rajinikanth and daughters Aishwarya and Saundarya at his residence in Chennai. The superstar takes time out from his busy schedule to spend auspicious days with his family. The photos of the celebration were posted by daughter Saundarya on her social media account. She wrote, “Holi with the one and only Kaala Superstar, my dearest and dearest appa. Holi is a special day for the superstar as it was during this day, ace director K Balachander rechristined Shivaji Rao Gaekwad as Rajnikanth decades back. Also, Latha Rajnikanth is celebrating her 59th birthday today which makes this day extra special for the family. The official teaser of his forthcoming movie Kaala was released today, and it created a buzz on social media. 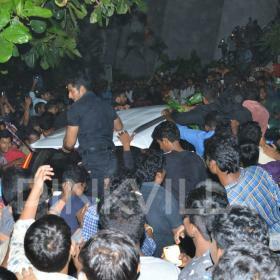 Fans have loved Rajnikanth’s avatar in the film. In Kaala, Rajnikanth will be seen essaying the role of a slumlord who is fearless and powerful at the same time. The teaser was earlier postponed from March 1 as a mark of respect to Jayendra Saraswati who passed away on February 28. The teaser starts with Nana Patekar asking, Kaala, kaisa name he re? (What kind of name is Kaala) The teaser has got Rajini’s mass dialogues, which is accompanied by fight sequences and apt background music. The teaser was shared by Dhanush on his Twitter page through links in various languages. It garnered a record breaking number of views on different social platforms within 16 hours of release. Rajnikanth appears in a black shirt and Dhoti in the teaser. 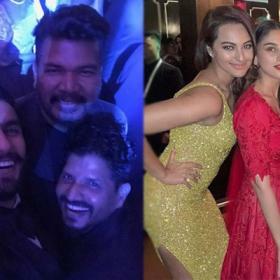 Kaala is directed by Pa Ranjith and stars Nana Patekar, Huma Qureshi, Anjali Patil, Eswari Rao and Sukanya in prominent roles. The movie is produced by actor Dhanush’s Wunderbar films and is scheduled to release on April 27,2018. I thought he would abstain this year…wasn’t he beloved to be close to Sridevi…. All these people who claimed to be close to Sridevi and were devastated at the loss seem to have moved on pretty quickly. Sad.